We will sell until no longer available! Mercury has discontinued manufacturing the VenSura. The VenSura is an outstanding performer for your 18" - 22" stem drive runabout. 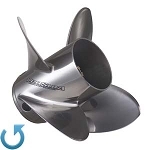 The VenSura prop runs smoother and planes your boat quicker than standard 3-blade propellers also hold the boat on plane at lower speeds - great for wake-boarding. For 225 FS and non-Mercury applications see Flo-Torq II reference chart.